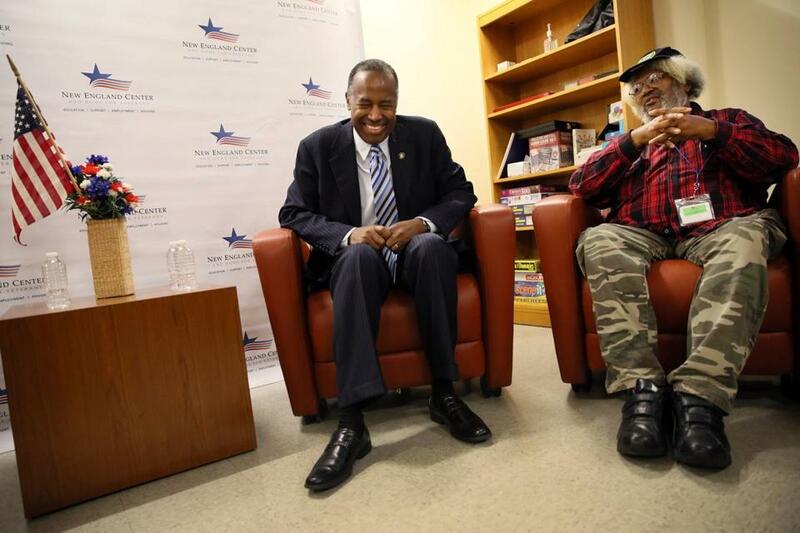 Secretary of Housing and Urban Development Ben Carson shared a laugh with veterans including Gregory Gregg Sr. (right) during a discussion at the New England Center and Home for Veterans in Boston Wednesday. Ahead of Veterans Day, the secretary of the US Department of Housing and Urban Development toured the New England Center and Home for Veterans in Boston Wednesday, calling it a full-service center that could be modeled across the country. 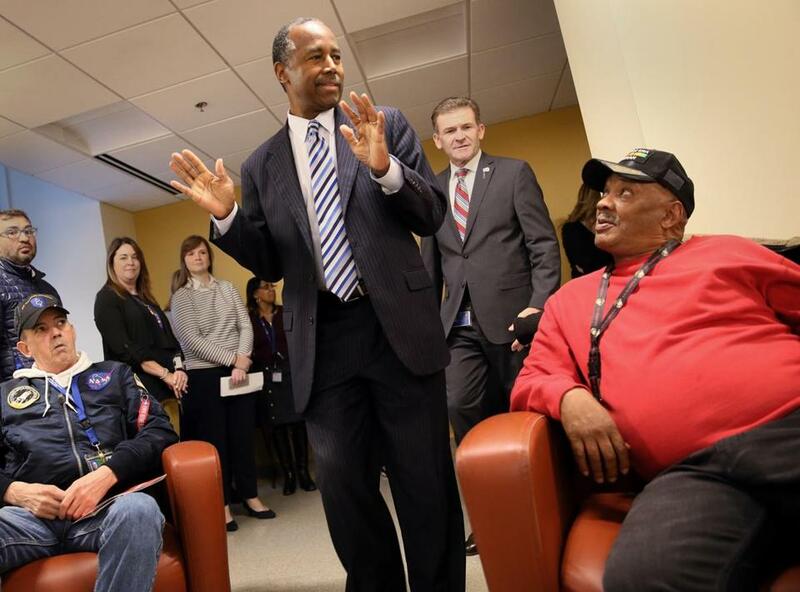 “I’ve heard very good things about it, and what they’re doing,” HUD Secretary Ben Carson said in an interview, minutes after seeing the downtown facility and meeting with six US service veterans who live at the center. It was Carson’s first visit to Massachusetts as HUD secretary, and he praised the center for its work to address veteran homelessness. The number of homeless veterans dropped nationwide by 5 percent last year, though it increased in Massachusetts by 15 percent, according to HUD data released last week. During the tour, those living at transitional and permanent units set up by the center said their sole complaint was the amount of time it takes for veterans to process the paperwork to seek permanent housing. Ken Mathews, 62, a Navy veteran, said he wants to return to work but that can be difficult without stable housing, while he bounces around in transitional housing. Ben Carson’s visit featured a discussion with veterans including John Watt (left) and Michael Pearson (right). “There’s a process that needs to be gone through, and there’s no way of speeding it up,” he said. Andrew McCawley, the center’s president, echoed the point and called it a regional housing problem. “Housing is in very short supply,” he said. McCawley said that HUD is the center’s second-largest source of federal funding, supporting rent subsidies, and for roughly a half hour he gave Carson a tour of the center, which was recently renovated. He pointed to a transitional housing area and a separate section of the building where 97 units of permanent housing are located. The center offers wraparound services, such as mental health counseling and job training. The center also provides daily hot meals. McCawley, a Navy veteran, told Carson that veterans are more likely to seek services if they are with fellow veterans. “They feel as if their service is being recognized,” he said.